Fall for me means the spicy scents of cinnamon, clove and nutmeg, all wrapped up with pumpkin or apples. For me these are warm, comfy scents as I gather things to make a warm nest for the cold winds of winter. I love hot tea, especially Chai and hot cider and warm breads. Hope I am making your mouth water! It is amazing how these scents bring back memories of fall days, trees turning beautiful colors and looking forward to carving pumpkins and thinking about Halloween. All these memories and thoughts seem to be triggered by this season and scents in the air. Winter starts getting nearer and peppermint, cardamon and of course hot chocolate and sugary marshmellows. I love the smell of orange and cloves in pomander balls and the smell of Christmas trees and wreaths. Spring comes round again and the sweet smell of fresh cut grass, Lavender and light citrus scents of lemon. Summer and herbs growing – Rosemary, Thyme, Lemon Balm. What scents of the seasons stir up your memories this Fall? 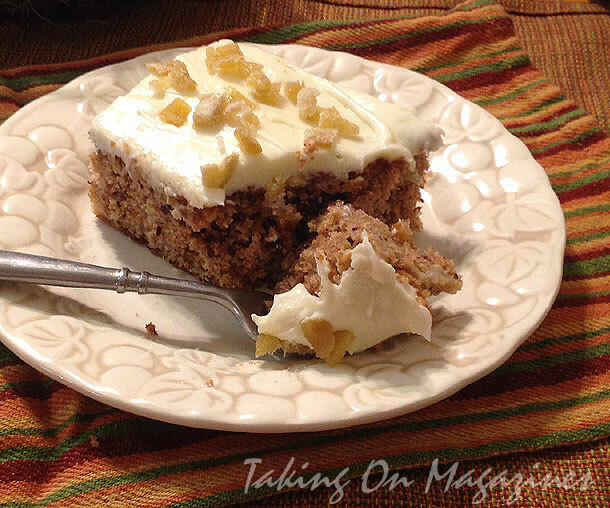 I want share with you a great cooking blog written by a friend of mine with great wit and a knack for finding great recipes. 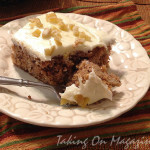 Her blog is http://www.takingonmagazines.com and yesterday’s post has a great recipe for and apple ginger cake and yes this is what she made and not from the magazine. Just wanted to tempt you as I am very tempted to try this over the weekend. Let me know if this one also is on your to try list. Succulence is Powerful! Have you ever heard of SARK? Mmm, sounds yummy. You have given me a good idea for holiday gifts.